Let me first start off by saying that I love this digital piano. For the price I got much more then expected! The bench doesn’t look like much and I actually feared I might break it with my ‘abundance of musical enthusiasm’, however after sitting down and making beautiful sounds on the keyboard, that was no longer an issue. So if you are or have a plus size musician then have no fear, Casio makes a sound product. As always though I would check the weight limits if you are concerned. As for sound quality it is the best sound you will get from a digital keyboard, most definitely. This may vary from a person to the other, but I get the slight impression that the keys, although weighted, still make that ‘click’ sound when pressed. This is a weakness of many different digital keyboards though, but those that stood a few feet away were not bothered by that ‘click’ that has yet to be cured by the digital keyboard manufacturers. 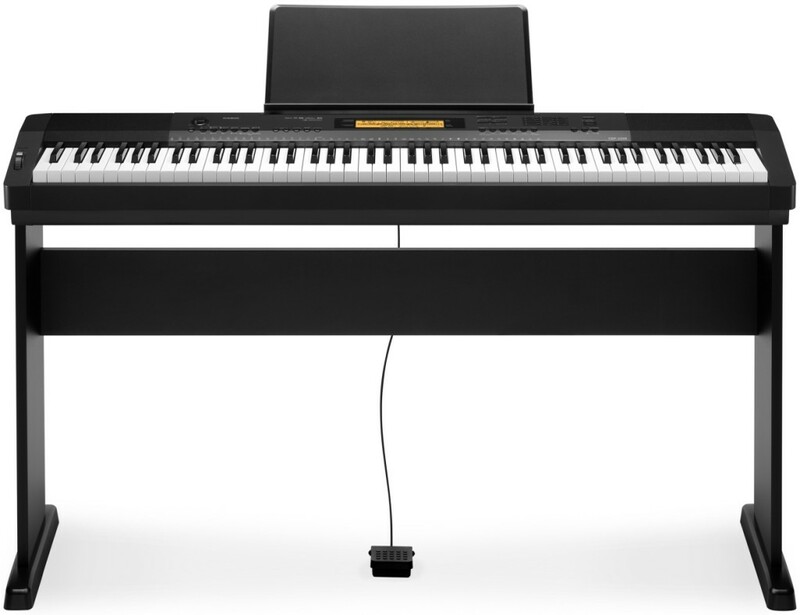 The keyboard came with a sustain pedal, stand and bench, all of which were made from Casio and are durable and of very good quality. This keyboard is great for musicians of all ages. I have found that the keyboard can withstand the abuse of multiple 6 year old musicians and that of temperamental teenagers, whom may not be as gentle as they should be with musical instruments. Everything was assembled so as soon as I brought the keyboard home I was able to start enjoying it immediately. Another great contributing factor to why I purchased the Casio CDP220 was the size. So compact and slim for all 88 keys! There are many extras on this keyboard that can’t be ignored. For me the biggest extra is the ability to use your Ipad with the keyboard and allows to add programs to your Ipad when connecting via the usb port. All of the additional sound effects are just a hoot and make practicing, which can sometimes be tedious, extra fun. There are hundreds of rhythms, sounds and songs already on the keyboard and you can record and save your own as well. The keyboard also includes some built in tutorials, which will teach you some popular pieces of beautiful music. I will say, please don’t forget to adjust the LCD screen like I mistakenly did. I thought I was either going blind or was afraid the keyboard had been damaged. Nothing had been damaged and I wasn’t going blind any quicker then I had thought, I simply didn’t follow the directions as they were given, that will teach me! The whole house enjoys the keyboard so much that I had to purchase a second so the teenager could have her own, I may need to get yet another one so I can have my own. With the use of headphones everyone can be their own musical genius and not bother anyone else. 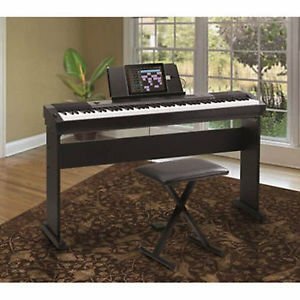 How lovely to be able to enjoy all of the pros of both a piano and a keyboard in one great product for one terrific price!